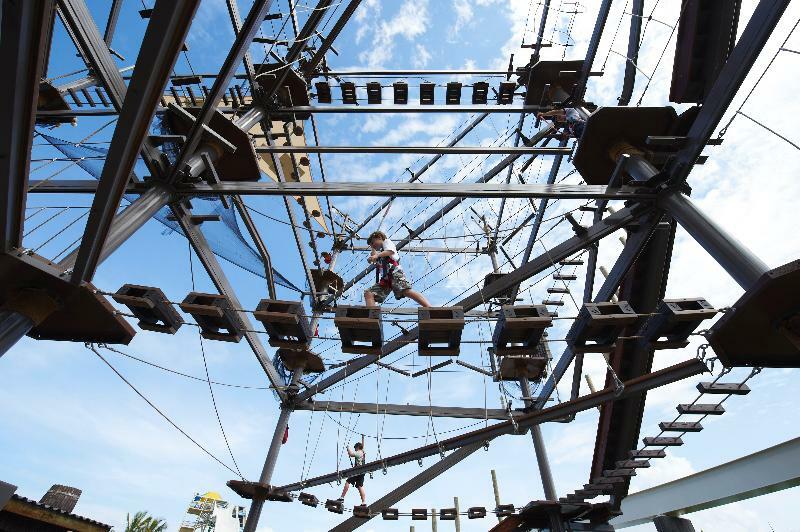 Fantasy of Flight has opened Wing Walk Air, an outdoor attraction featuring an adrenaline- pumping, 600-foot zip line suspended four stories above water and a three-level ropes course with 33 midair challenges. The attraction is the first of its kind in Polk County, located midway between Tampa and Orlando. For years, Fantasy of Flight guests have been able to experience the thrill of flight vicariously through the stories of daring pilots, told both live and through multimedia exhibits. Many have even upgraded their experience to include a hot air balloon ride or biplane ride. But now, virtually every Fantasy of Flight guest can experience firsthand the excitement of “flight” and the rush of wind in their hair with the addition of Wing WalkAir – an all-new outdoor attraction featuring an adrenaline- pumping, 600-foot zip line suspended four stories above water and a three-level ropes course with 33 midair challenges. The attraction is the first of its kind in Polk County, located midway between Tampa and Orlando. Safely harnessed and tethered to the zip line, guests get to “fly” through the air a total of 600 feet, to the landing tower and back again, giving them double the chance to take in the scenery or to see it for the first time if they were too scared to open their eyes! Meanwhile, the ropes course tests participants’ balance and bravery with a series of 33 elements to be navigated while tethered to an overhead line, including exercises that mimic walking a tightrope, balance beam, and horizontal and vertical ladders, all while suspended as high as four stories off the ground. Three levels of challenges offer something for children to adults, whether mildly adventurous to absolutely fearless. And, while zip lining or navigating the ropes course, guests will get a birds’ eye view of Fantasy of Flight, scenic Lake Agnes and the rare and vintage airplanes on display on the tarmac. Groups interested in team building and group challenges can also take advantage of Fantasy of Flight’s diverse meeting space and on-staff event planners to create a full day or multiday event. Group rates are also available, call 863-984-3500 for details. Regular, one-time admission for the zip line and ropes course is $22, or $15 for the zip line and $12 for the ropes course when purchased separately. Pricing is for children and adults and does not include 7 percent sales tax. Combo pricing is available with and without general admission included. Fantasy of Flight admission is not required for admission to Wing WalkAir. General admission is $28.95 for adults, $26.95 for seniors ages 55 and over and $14.95 for children, ages 6-12, plus 7 percent sales tax. Special rates for groups and package combination tickets are available. To participate, guests must be at least 48″ tall or must be accompanied by an adult. All guests must be able to understand and follow safety rules as given by the safety personnel. The participant weight limit is 300 pounds and guests must be able to fit in the harness. Athletic shoes are recommended; no flip flops or loose shoes are permitted. The opening of Wing WalkAir takes place in plenty of time for Fantasy of Flight’s signature event, its Fifth Annual Roar n’ Soar, Saturday, Nov. 12 and Sunday, Nov. 13 from 10 a.m. to 5 p.m. (gates open at 9 a.m.) The two-day racing extravaganza showcases the finest classic racing machines ever built for land, sea or air and promises to feature an even more thrilling, jam-packed roster of events, including hair-raising aerial demonstrations, nail-biting classic car slalom competitions, exhibition fly-bys from sleek vintage race boats, an aerial “dog fight” by powered paragliders, an exciting sports showcase featuring skilled motocross riders. Meanwhile, the classic boat show and regatta, and classic car show provide entertainment for the slightly more faint of heart. The zip line and ropes course comprise only the first phase of Fantasy of Flight’s Wing WalkAir attraction. Plans are already underway for new additions to the area including a rock climbing wall and rappelling area to be installed this winter. 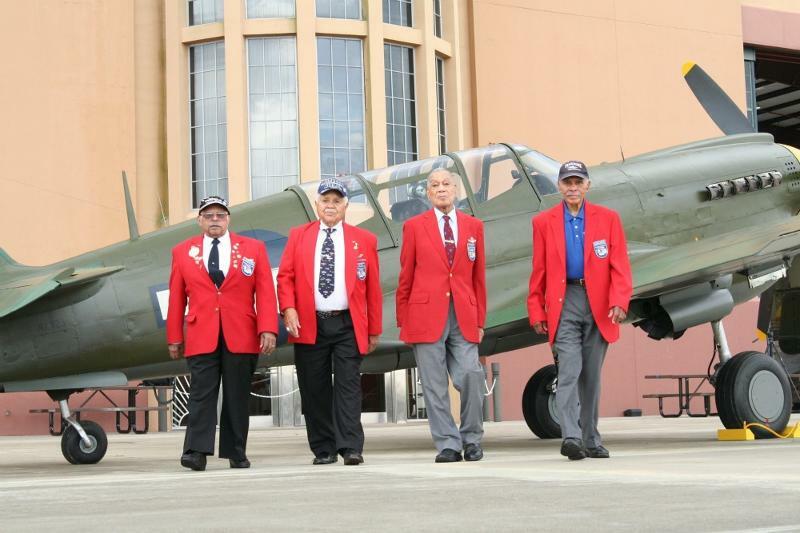 Fantasy of Flight, the Polk City, Florida aviation attraction, hosts members of famed Tuskegee Airmen for a special 3-day event, "They Dared to Fly," Feb. 10-12. The Tuskegee Airmen tribute is part of Fantasy of Flight’s Third Annual Legends & Legacies Symposium Series. For three days, guests can experience firsthand what it was like to serve as a pilot in the military during segregated America. The pilots will share stories about their military service and unprecedented success despite operating in these segregated units. Of the original group of nearly 1,000 trained pilots and 15,000 ground personnel that made up the Tuskegee Airmen, roughly 100 pilots and 200 ground crew are alive today. 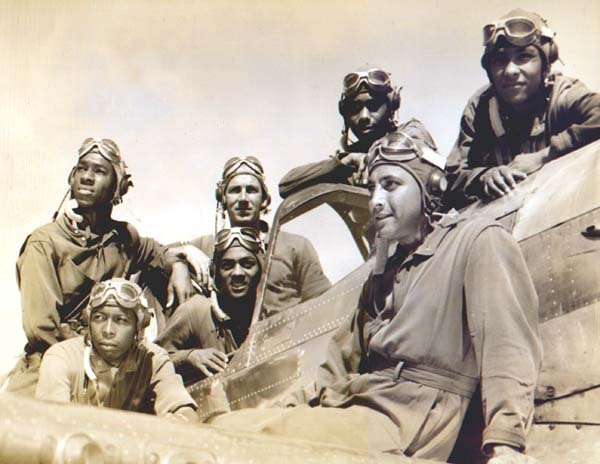 “They Dared to Fly” will be held Thurs., Feb. 10 through Sat., Feb. 12 and feature several open-forum/question-and-answer sessions at the symposium as well as meet/greet autograph signings with five of the original Tuskegee Airmen: Hiram E. Mann, Raymond Cassagnol, George E. Hardy, Roscoe C. Brown, Jr., and Leo. R. Gray. The symposiums are included in the attraction’s general admission price. Roy Archer, son of airman Lee Andrew Archer, Jr. will retell his father’s story during the series. Archer dreamed of becoming a fighter pilot at an early age. That dream became a reality when he joined the U.S. Army Air Corps’ and became one of the Tuskegee Airmen. During the 169 combat missions he flew in the European Theater, Archer was credited with downing five enemy aircraft, earning him the coveted title of “Ace.” Lee Archer passed away last year. In addition to the symposium, Fantasy of Flight will host a special, reservations-only luncheon with limited seating in honor of these original aviation veterans. The luncheon will be held Fri., Feb. 11, at noon at the Orlampa Conference Center at Fantasy of Flight. Tickets are $65 plus tax per person and reservations are required. For tickets, visit www.fantasyofflight.com/livinghistory or call 863-984-3500, ext. 220. Corporate tables and individual tickets are available. Finally, in tribute to the Tuskegee, fourth through twelfth grade students are invited to participate in a contest writing essays that focus on leadership, excellence, advocacy, and determination, virtues that helped the Tuskegee Airmen achieve success or about how these principles can help students achieve goals. Cash prizes are available, with entries due on or before 5 p.m., Mon., Feb. 28, 2011. More details are available at www.fantasyofflight.com. · Hiram E. Mann (Titusville, Fla.) – Mann entered the Army Air Corps as a Pre-Aviation Student in 1942. He became an Aviation Cadet and completed Single-Engine Combat Pilot Training at Tuskegee Army Air Field (TAAF). Mann flew combat missions around the world before retiring after 21 years of service. He now lives in Titusville. Florida. · Lt. Raymond Cassagnol (Oviedo, Fla.) – Cassagnol is an aviation pioneer. In January 1943, he was one of three enlisted airmen from Haiti, selected for training in America. After successfully completing all phases of military flight training, Raymond Cassagnol received his pilot wings; the first of five Haitian pilots to graduate at Tuskegee. His contributions to World War II have made him a celebrity in his own right. Appearing in venues nationwide, 90-year old Raymond Cassagnol is the last-known surviving Haitian-Tuskegee Airman. · George E. Hardy (Sarasota, Fla.) – Hardy started Aviation Cadet Training at Tuskegee Army Air Field, Alabama, in December 1943, and graduated as a pilot in September 1944. He has flown in combat missions around the world including: Italy, Germany, Guam, and Korea. Hardy retired in November 1971 with the rank of Lt. Colonel. · Roscoe C. Brown, Jr. (Riverdale, NY) -Brown is considered by many as one of the country’s most distinguished African-American advocates. A member of the Air Force and the Tuskegee Airmen, Brown is credited as being the first 15th Air Force pilot to shoot down a Nazi jet fighter aircraft. For his bravery he earned the Distinguished Flying Cross and Air Medal with eight Oak Leaf Clusters. After his military service, he received his masters and doctorate degrees. In 1969 he became the director of the Institute of Afro-American Affairs and a professor of education. During his career he has been director or chair of over 25 organizations including the Boys & Girls Clubs of America, the Metropolitan YMCA, the Jackie Robinson Foundation, and Libraries for the Future. · Leo. R. Gray (Ft. Lauderdale, Fla.) – Gray, after completing the College Training Detachment Program at Tuskegee Institute, he entered aviation cadet training to become a pilot. He graduated from the Tuskegee Army Air Filed Flying School as a 2nd Lieutenant Single Engine Pilot in Class 44-G (SE). Gray was stationed in Italy as a fighter pilot with the 100th Fighter Squadron, 332nd Fighter Group. He flew 15 combat missions over Europe before separating from active duty in 1946.During his 41 years of military service, Lt. Col. Gray was awarded the Air Medal with one oak leaf cluster, a Presidential Unit Citation, and the Mediterranean Theatre of Operation ribbon with three battle stars. The compelling and historically significant Third Annual Legends & Legacies Symposium Series brings to life the experiences of some of America’s most courageous aviators through permanent and semi-permanent exhibits, real aircraft, and most importantly, their own personal stories and interactions with guests. In addition, the newly expanded series will also include heroes from WWII who served on the ground protecting and supporting the men and women in flight, as well as relatives of those heroes who fought in the air. The six topics scheduled for 2011 include “They Dared to Fly: Featuring the Tuskegee Airmen” in honor of National Black History Month, Feb. 10-12; “Breaking All Barriers: The Amazing Women of WWII,” in honor of National Women’s History Month, March 4-5; “Calculated Risk: The Extraordinary Life of Jimmy Doolittle,” April 15-16; “D-Day: The Invasion of Normandy,” May 13-14; “The Pacific War: Power and Pursuit,” June 10-11; and “The Great Escape: Heroes Underground,” Oct. 14-15. The series events are included in the price of Fantasy of Flight general admission of $28.95 plus tax for adults, $14.95 plus tax for youth (age 6-15) and five and under are free with full paying adult. Group rates are available. For more information, visit www.fantasyofflight.com. Hours are 10 a.m. – 5 p.m. daily. General admission is $28.95 for adults, $26.95 for seniors ages 55 and over and $14.95 for children, ages 6-15, plus 7 percent sales tax. Annual passes are available for $69.95 for adults, $39.95 for children ages 6-15, plus 7 percent sales tax, and are good for one year from the date of purchase. Biplane rides, through Waldo Wright’s Flying Service, and hot air balloon rides, are available for an extra charge. For more information about Fantasy of Flight, call 863-984-3500 or visit www.fantasyofflight.com.